The Antigua Travel Guide from The Caribbean Amphibian is your one stop source for information for the Caribbean island delight. Just as it was over 200 years ago, when Admiral Horatio Nelson sailed to Antigua, establishing Great Britain's Caribbean base, the same things that attracted the Royal Navy, now attracts tourists. Back then, trade winds blew British war ships into the English Harbor. Now those same trade winds blow for Sailing Week. As you will find out in the Antigua travel guide, there are many reasons to visit this Caribbean island paradise. Hikers enjoy the winding coastline of Antigua, with its secluded beaches. Snorkelers and scuba divers are attracted by the coral reefs. Volcanic in origin, Antigua and Barbuda are in the middle of the Leeward Islands, in Eastern Caribbean, about 17 degrees north of the equator and just east of St. Kitts and Nevis. Antigua is the largest of the Leeward Islands. Its sister island, Barbuda, is a flat coral island, about 30 miles north. It is a small island that is only 68 square miles and is so undeveloped that it seems almost deserted. Many ships were wrecked on the reefs of the little island of Barbuda, and it used to be a scavenger's destination. You will thrill to the sight and sound of the exotic birds on Barbuda as well. This is home to the magnificent Frigate Bird Sanctuary, which contains over 170 species of birds, and has over 5,000 frigate birds. There are miles of breath taking, peaceful pink and white sand beaches, and there are national parks and blow holes, and a phenomenon called the Devils Bridge, which is a must see. It was created naturally by the colliding of the Atlantic and Caribbean surf. Antiguans are proud to boast that they have a different beach for every day of the year. While it may be more puffery than fact, there are more than enough beaches to keep even the most demanding sand lover happy. As a result, you can imagine why this is a place where one goes to take things easy. You can stroll around, shopping at the markets, drink the delicious fresh juices of the coconuts and the wonderful pineapple juice. The locals are very friendly, and have many interesting stories to tell. The way of life in Antigua and Barbuda is dominated by water, and visitors will find all kinds of nautically themed activities here. Visitors usually visit Nelson's Dockyard in the English Harbor. 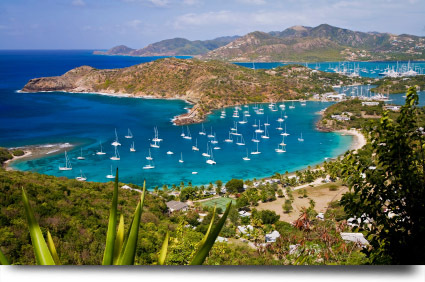 This is at the forefront of Antigua and Barbuda's yachting and sailing. Visitors enjoy a bright Caribbean sunset, while drinking their preference of rum punch or icy fruit juice. Popular Shirley Heights is the center of activity in the evenings, with views of the ocean, the smell of a barbecue, and local music to dance to, till the wee hours of the morning. Use the links in the Antigua Travel Guide below to find out more about this Caribbean island wonderland. Be sure to stop back soon, we update the Antigua Travel Guide often!